The final installment of the 3rd Street Project of recreating 3rd street via pictures and text. 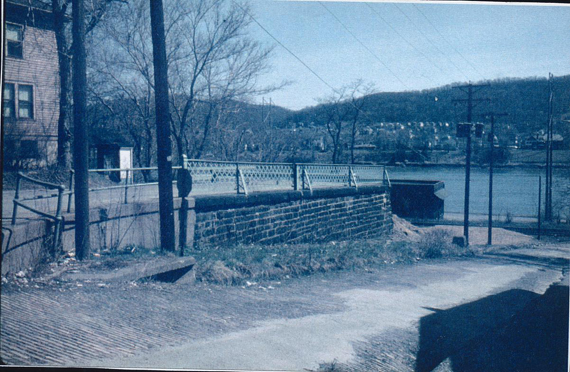 We begin here with College Street and go eastward to the old Chester Bridge and continue on including Thompson Place. 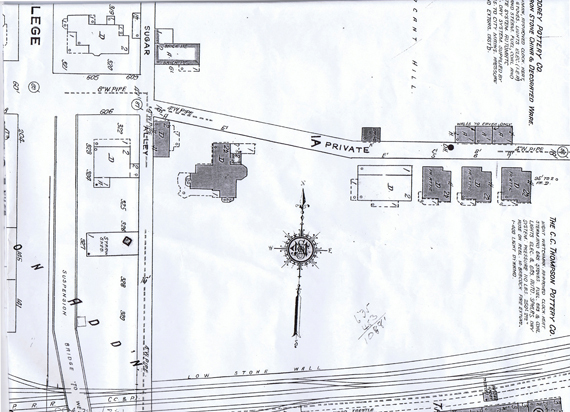 The 1923 Sanborn Fire Insurance Map showing the 500 block of East Third Street, the entrance to the Chester Bridge and Thompson Place. The cross Street that the name is chopped off on the map is College Street. 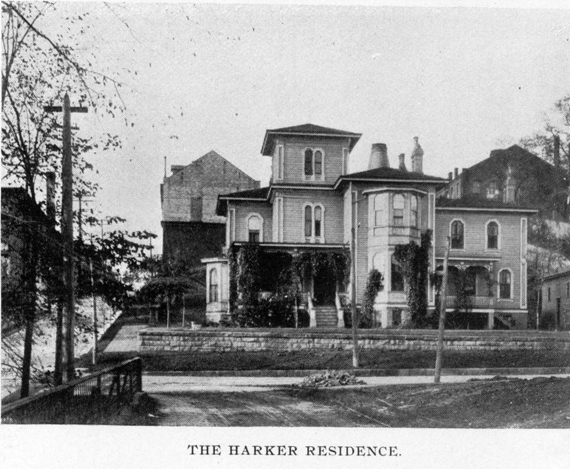 The Harker Residence, 605 East Third Street. The above picture makes more sense when you look at the following pictures. 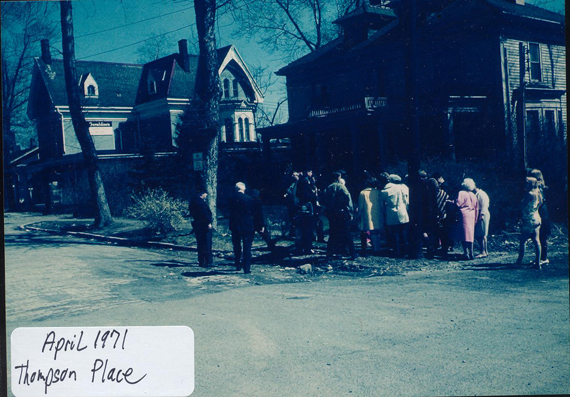 The following pictures comes from the Inger Lloyd, of Wellsville, collection. Many thanks to her for the pictures. 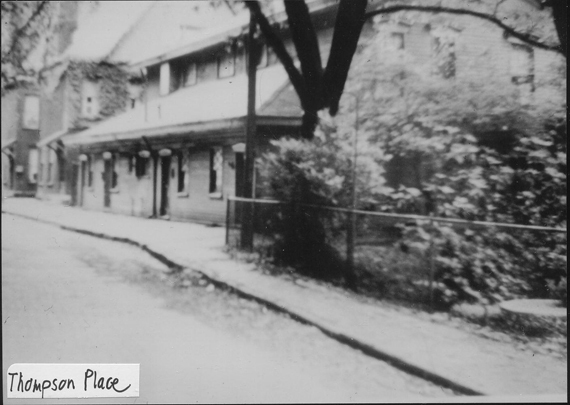 Thompson Place: The first three pictures establish the location of Thompson Place. Traveling east along East 3rd Street if you continued straight, it was an extension of East Third Street, instead of turning right onto the Chester Bridge you would have traveled between the two stone pillars and would be in Thompson Place. At one time there were two lions on top of the pillars and a fountain in the center of the lane. 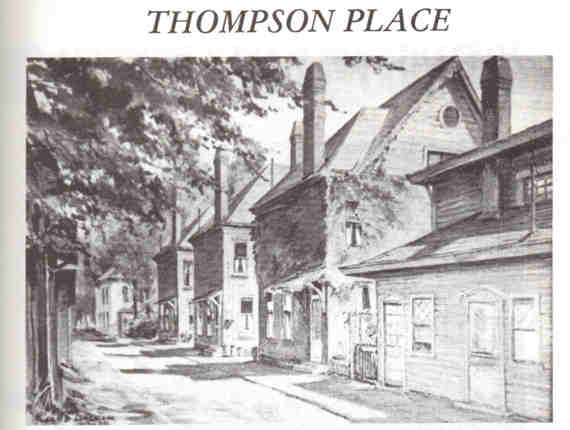 Thompson Place was owned by Will L. Thompson, son of Josiah Thompson owner of the Thompson Hotel. Will Thompson owned the house that over looked the Ohio River. Other original owners of the homes there were Josiah Thompson, William Tebbet, Bentley Pope, J. E. Mcdonald and John C. Thompson. 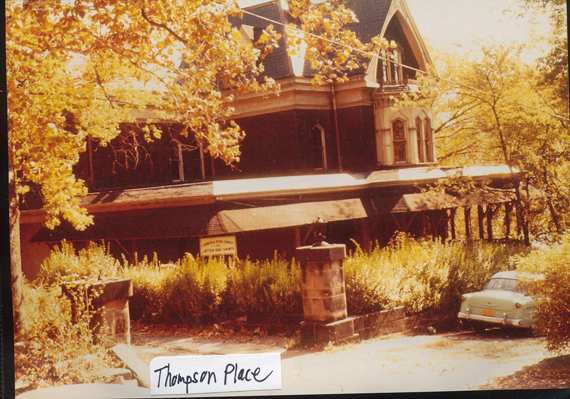 John C. Thompson Home, Thompson Place. The following comes from the 6th Annual Tri-State Pottery Festival - 1973 - Souvenir Booklet. Each year the official Festival Souvenir design is the creation of Hans Hacker. 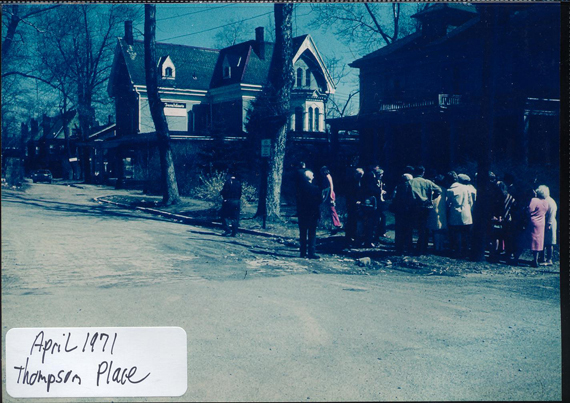 1973 brings back to us Thompson Place, known fondly as "The Lane." 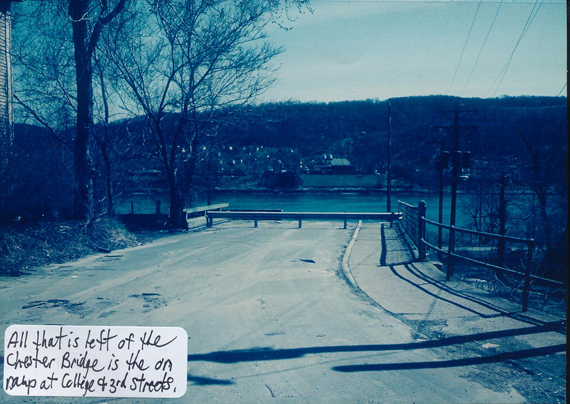 The location is between East Third Street and the access to the old Chester Bridge. Originally the acreage of this purchase was 43.7; extended east of the MA to Vine Street and Bradshaw Avenue. Josiah Thompson and his wife, Sarah Jackman, first lived in a frame house called "Sandy Mount." Later Sandy Mount was the first home of many newly weds in the families. 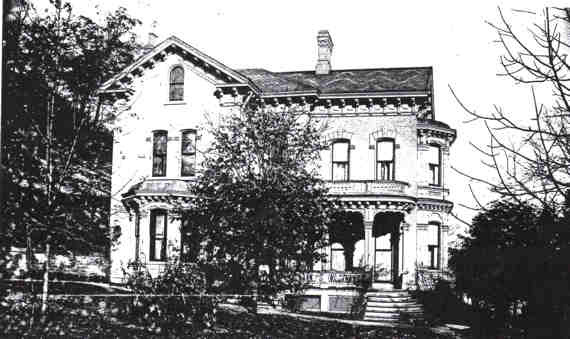 In approximately 1878 Josiah built the large Victorian home on the river side of the Lane. It was in this home Will Lamartine Thompson had his grand piano. 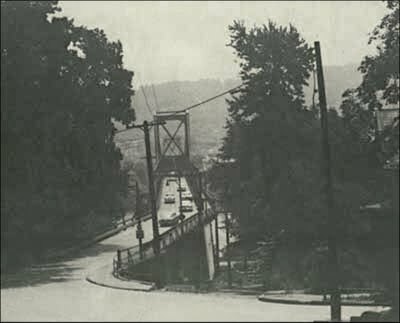 The beauty of this secluded area overlooking the Ohio River could well have been the inspiration for his "Home on the Old Ohio." 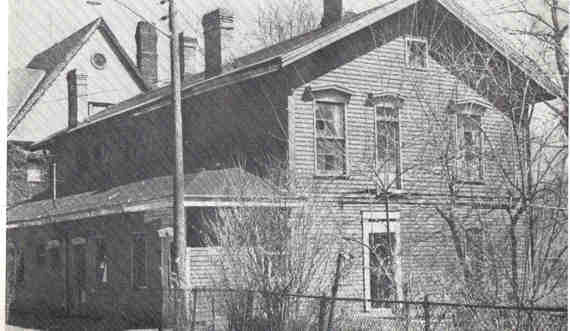 Josiah's son, John C., built the brick home at the far end of the lane. 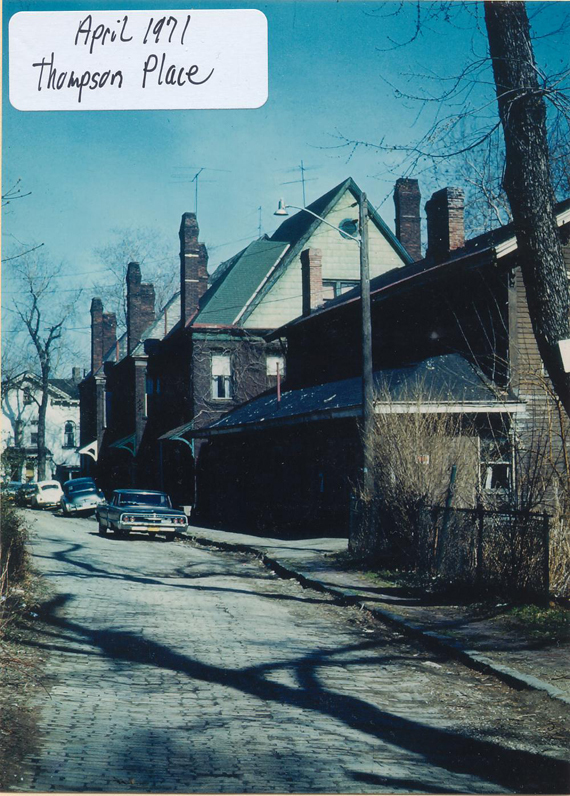 His son-in-law, Elmer Moses Golding, built three identical brick houses in the Lane. The "Wool House" was next to Josiah's own home, and so named because it was used for storage of wool to be shipped to market from the Broadway wharf. On one occasion Josiah himself took a shipment of wool on a flat boat to New Orleans-and then walked the trails back home. The entrance to Thompson Place is marked by two pillars. At one time majestic Lions guarded the area from atop the pillars. To small children they were not fearsome, but a special delight to reach a perch astride the King of Beasts. The fountain in the center of the Lane was a spot of beauty mid beauty and, once again, the delight and temptation of small children who gravitate to water in natural habitats. Let us now turn our attention to Second Street.